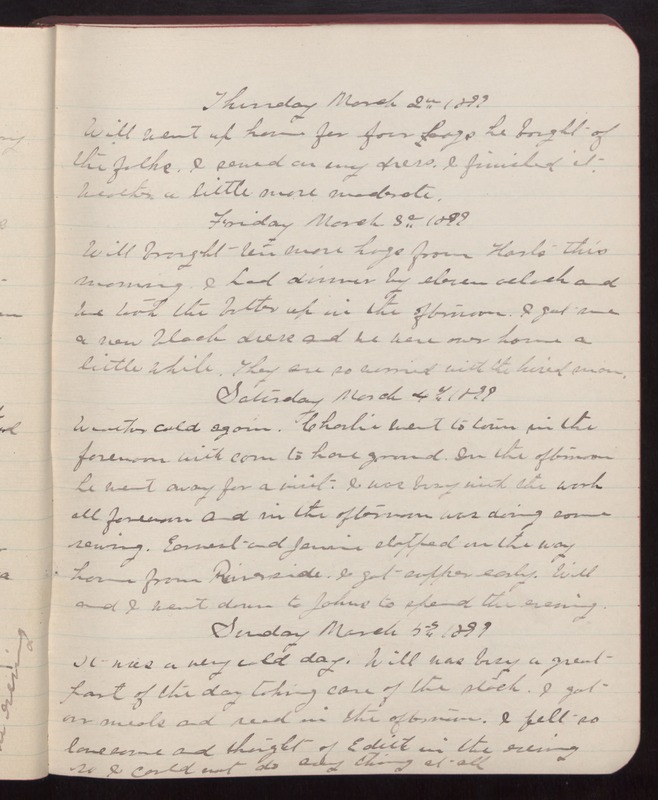 Thursday March 2d 1899 Will went up home for four hogs be bought of the folks. I sewed on my dress. I finished it. Weather a little more moderate. Friday March 3d 1899 Will brought ten more hogs from Harts this morning. I had dinner by eleven oclock and we took the butter up in the afternoon. I got [Ma] a new black dress and we were over home a little while. They are so worried with the hired man. Saturday March 4th 1899 Weather cold again. Charlie went to town in the forenoon with corn to have ground. In the afternoon he went away for a visit. I was busy with the work all forenoon and in the afternoon was doing some sewing. Earnest and Jamie stopped on the way home from Riverside. I got supper early. Will and I went down to Johns to spend the evening. Sunday March 5th 1899 It was a very cold day. Will was busy a great part of the day taking care of the stock. I got our meals and read in the afternoon. I felt so lonesome and thought of Edith in the evening so I could not do any thing at all.